Longtime Toronto Blue Jay radio broadcaster, Tom Cheek, passed away yesterday (Sunday, October 9th) after a valiant battle with cancer. I've included part of Spencer Fordin's article on the Blue Jays' web site below but I wanted to share a couple of personal insights into Tom's career with the Jays. Back in the early years (late 70's or early 80's) I was staying at the Ramada Inn in Clearwater, FL during Spring Training. Many of the Jays' staff and associated personnel were staying there. I came down for breakfast one morning and saw Tom with several of his friends. Seeing that I was eating alone, Tom came over and joined me for breakfast. I'll never forget that gesture of kindness. Tom always had a kind word of greeting for me over the years. When I had a guest chapel speaker with me on Sundays he'd come over and introduce himself and ask about my guest. Two seasons ago when Tom was in the midst of his battle with cancer I compiled a fairly extensive list of e-mail messages from my friends. I put them together in a special binder and took them to the ballpark expecting to give them to Jerry Howarth to pass along to Tom. Tom was at Skydome that day and we met in the "tunnel" on the field level. When I presented the book to Tom he was overcome with tears and thanked me profusely for the expression of love and support. We've lost a great man and a broadcaster whose consecutive string of games called (4,306) was phenomenal! Please pray for Shirley and the family as they grieve the loss of a beloved husband and father. 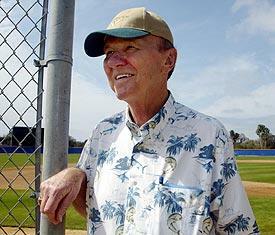 TORONTO -- Longtime Toronto broadcaster Tom Cheek passed away Sunday after a 16-month battle with brain cancer. Cheek, 66, was the charter voice for the Blue Jays in 1977 and broadcast more than 4,000 straight games before his health forced him from the booth midway through the 2004 season. Cheek, who passed away at this home in Oldsmar, Fla., is survived by his wife, Shirley, as well as three children and seven grandchildren. "It's difficult to put into words the overwhelming sense of grief and loss shared today by the Blue Jays family, the city of Toronto, the extended community of Major League Baseball and its many fans," said Paul Godfrey, the Jays president and CEO. "Tom Cheek has provided the soundtrack for the most important moments in this team's history, with his choice of words and intonation always perfectly suited for the occasion. He was far more than just an outstanding announcer, though. He was a great goodwill ambassador for baseball in Canada. "His love for the game, which radiated through his words on the radio, captivated fans across this country and helped to grow the sport from one coast to the other." Cheek's broadcasting career ran three decades -- running the gamut from college sports to Olympic events -- but it forever changed when he landed the Jays' job in 1977. The venerable play-by-play man called 4,306 consecutive games, a streak that lasted from April 1, 1977 to June 3, 2004. He was called away from the booth by the sudden passing of his father, and shortly thereafter he was diagnosed with a brain tumor. Surgery and the resulting rehabilitation kept Cheek from the job he loved, but he returned to the ballpark from time to time, whenever his health would allow it. Wow, many hours have personally been spent following the Jays with "Tom and Jerry". He was there for the beginning, for the best, and for the most difficult, of Blue Jay history. I fondly remember meeting him in the visitors broadcast booth in old Cleveland Indians stadium. He was gracious even though busy. My prayers are with the the Cheek family, as well as the extended Blue Jay family.